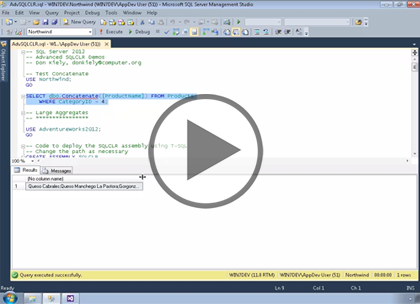 In this course you will explore two kinds of code modules that can be implemented with only .NET code. Those are Aggregates and User Defined Types. These module types are not support by T-SQL You will also see how to improve performance with ordered tabled valued functions that return data that is already sorted by defining them correctly in the database. This course assumes that you have a basic familiarity with the concept of relational databases and a basic understanding of what SQL Server is and the high-level tools in it, as well as how to create and manage objects using Management Studio. You should also have a basic understanding of how SQL Server implements security, including its authentication and authorization schemes, and how to assign permissions on securable objects to principals. You should know the fundamentals of Transact-SQL to write queries to retrieve and update data, and how to execute scripts using the query editor in Management Studio. The course spends a lot of time deep in T-SQL code, so you should feel comfortable writing basic queries that involve joins of multiple tables, as well as using built-in T-SQL functions and other code modules. It will be very helpful, but not absolutely necessary, to have experience with .NET development using Visual Studio 2010 or 2012 for the portions of the course that deal with SQL Server Data Tools.